On April 5, members of the American Red Cross and Houlton Fire and Ambulance Department honored two sixth-graders at Houlton Middle-High School for their bravery. HOULTON, Maine — On April 5, members of the American Red Cross and Houlton Fire and Ambulance Department honored two sixth-graders at Houlton Middle-High School for their bravery. Landon Wotton and Parker Kowalski were the guests of honor at the Friday morning assembly as the duo were lauded by the American Red Cross as part of that group’s “Real Heroes” honorees. The two students are among several area residents who will be formally recognized Friday, May 17, at the 21st annual Real Heroes Awards Banquet at the Stone Ridge Event Center in Presque Isle. 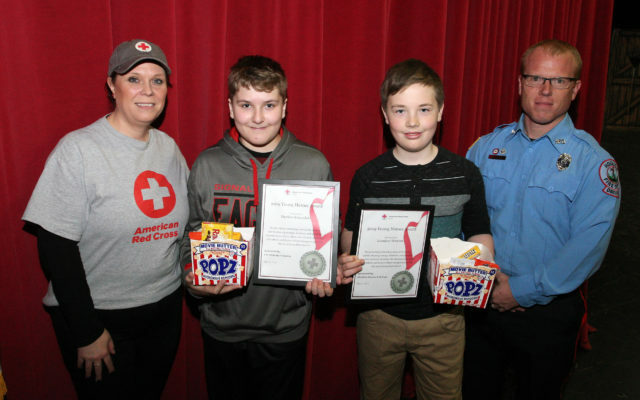 Mary Green, community manager for the American Red Cross in Aroostook County, said she wanted to give the two boys their awards early in front of their peers in the hopes that it may spark one of them to take action when the situation arises. The Red Cross selected the two youths, both 12-years-old, to receive 2019 Young Heroes awards for their bravery in helping save a man’s life back in May 2018. The boys were at Houlton’s Skate Park when they saw a man fall down near his vehicle. The man’s name has never been released. Kowalski said he had never called 911 before so he dialed the number and handed his phone to Wotton, who spoke with dispatchers. D.J. Norton of the Houlton Fire Department presented each boy with challenge coin for his bravery. Norton said he appreciated the boys’ efforts in identifying a person in need and taking action. “They could have just let it go and went on their way, but they decided to take action and it takes a special someone to do that,” Norton said. She said firefighters, police officers, ambulance personnel and teachers are also heroes for the work they do on a daily basis. The boys were presented with medals, along with movie tickets, snacks and a certificate for a free dinner. Norton also gave the youths commemorative coins for their efforts. Green added that she wanted to make the presentation in front of the boys’ peers in the hopes that it would spark others to take action if the situation ever warrants.